We like to picture the disco dancefloor as a glittering model of the cosmos—and not just because the disco ball at the center makes everybody feel like a star! Although maybe we should have gone with that, because it's a lot more catchy than what we were thinking. It's just that with the fog machine cranked up, the only visible light is reflected by the dancers' electric moves and their shimmering outfits! Yeah, we should have stuck with the thing about the stars. Anyway, this Plus Size Women's Disco costume features bright colors in an eye-catching pattern that was borrowed from the mind-bending fashion of the 60s, and it's covered head to toe in metallic sequins that belong to the 70s, when everything really seemed to sparkle! With flared cuffs on the sleeves and pants, this spectacular suit will make you look like a cross between a psychedelic alligator or an opulent ostrich: in other words, a real party animal! 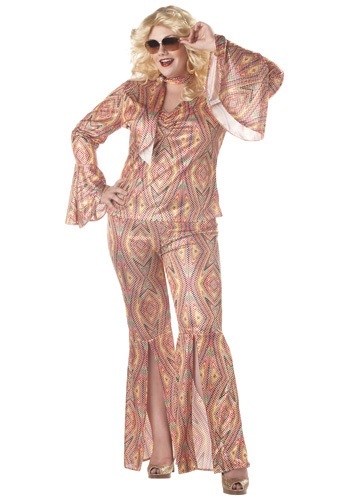 And since psychedelic alligator skins and opulent ostrich feathers cost a pretty penny, we recommend sticking with a 100% polyester ensemble like this for your next throwback bash or decades party. It's good for a complete look, including a matching scarf. It comes with everything you need, except for your favorite pair of boogie shoes. Though a poofy wig or some vervy sunglasses are a great way to make it feel like all the action revolves around you!